A new Nigeria just hatched out of its egg in the last 48 hours wherein the presidential elections took place and all results announced with the declaration of a winner. As it stands, Dr. Goodluck Ebele Jonathan has been declared the winner of the elections having scored the highest number of votes and met the threshold of attaining 25% of votes cast in more than two-thirds of the states of the Nigerian federation and the Federal Capital Territory. There is scope for analysis of the numbers as people draw conclusions and assumptions from the results but this is a time when Nigeria needs to present unity rather than division, resolve rather than prevarication, progress rather than stagnation and optimism rather than cynicism. Despite the misgivings of some and the facetiousness of those who will never be pleased no matter how hard we tried, these elections were by far the freest, the fairest, the most credible and the best involved people have been in deciding who leads them. Whilst the turnout was low in some areas, what mattered was those who decided and took the opportunity to vote and that was just a shade over 50% of the electorate. It would have been nice to have a situation very much like Australia where voting is compulsory but that requires a lot more technology to implement. Nigeria has taken a number of baby-steps that are leaps and bounds beyond the rotten elections of 2007, we proved we could do it and do it right. The refusal of opposition parties to endorse the results does not invalidate the will of the people, it simply represents a difference of opinion and that is all. The incumbent President has to be commended for giving the Independent National Electoral Commission (INEC) the independence to do its work, he presented the scope for credible elections. Professor Attahiru Jega as chairman of INEC has presented any Project Manager worth their salt a case-study in turning around a failing situation that was fast becoming an embarrassing farce into a remarkable success of managing time, plans, people and resources. Employing members of the National Youth Corps Service (NYSC) as INEC staff took the scope for manipulating the elections out of the locally connected civil and public service staff and put it in the hands of those who in service of their nation could be assumed to be unbiased, impartial and selfless – some were suborned but that was to be expected. Professor Jega found a way of delivering credible elections in a generally corrupt environment by making the people stakeholders in protecting their votes and by having the whole process conducted at the polling units with administration only pertaining to the collation of results. The entreaty to voters to observe, record and report from their polling units meant that discrepancies could be traced back through the paper trail and submitted reports to eliminate electoral malpractice everywhere. It was the right thing to do, INEC could not be everywhere but the people to whom the voting pertained could be and help to ensure INEC is fully apprised of developments in almost 120,000 polling units. With the appointment of collation officers for each state, these being eminent and leading academics, Professor Jega shared the burden of reputation and integrity because each of these collation officers would have demanded to see the paper trail, scrupulously and meticulously handled the data and no doubt double-checked the tallies before putting their names to the business of staking their hard earned reputations on announcing the results. It was a triumph of choosing the right people carefully and creating a critical mass that could only result in credible elections. The vote figures make interesting reading, depending on how they are read, in terms of wins, the country was literally cut in half along the lines of a North-South divide, but closer inspection shows that the ruling party is still the national party and the opposition parties are still regional parties. It has always been my view that the opposition parties would likely reduce the footprint of the ruling party in the legislative and gubernatorial elections but they were nowhere near being able to take the presidency. They just did not have the spread either singularly or in a coalition, it has to be a work in progress to shift the ruling party’s predominance to become a credible and effective opposition. INEC’s job is by no means complete, the gubernatorial and state house of assembly elections will hold on Tuesday the 26th of April, 2011, just after the Easter holidays and we must not forget the postponed 19 Senate seats and the 48 House of Representatives seats. Nigeria however has a credible, viable and possible future where the people elected have a legitimate mandate which they should assume with a sense of accountability to the electorate. The electorate should not slack in demanding answers to their questions, solutions to their problems and actions to their situations that will move the country on to the right track of realising its potential and inheriting its promise. Nigerians all, at home and abroad should be proud to be called Nigerian or be associated with Nigeria. We have spoken; let the country start that great journey with the President-elect ready to take the mantle of leadership and lead with vision, mission, destiny and attainment. Those who need to wallow in every kind of negativity they can muster are within their rights to do so, they can decide to catch up later but they will not be allowed to hold us back no matter how deep their grievances. I believe today in a country called Nigeria – What say you? INEC Nigeria: Summary of the Presidential election results per state. 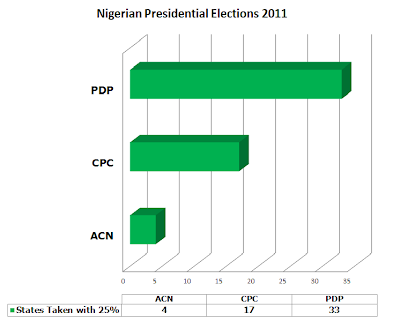 INEC Nigeria: Summary of votes cast for each political party.